We present an unusual cause of progressive cyanosis in a child appearing 2 years after successful Fontan surgery for tetralogy of Fallot with hypoplastic right ventricle. The cause of cyanosis was identified as one large venous channel draining into the left atrium. The channel was closed by Amplatzer vascular plug resulting in improvement of oxygen saturation. These communications result in progressive increase in cyanosis because of either a reduced effective pulmonary blood flow or an increased admixture of pulmonary venous return. In most cases, it is possible to detect the anomalous channel and offer catheter-based intervention. A 7-year-old girl child, had tetralogy of Fallot with hypoplastic right ventricle and adequate branch pulmonary arteries (tricuspid valve measured 8.5 mm, "Z" score -4.2 at the time of Fontan completion). She had undergone modified right Blalock-Taussig (BT) shunt in infancy followed by bidirectional Glenn shunt and ligation of pulmonary artery and takedown of BT shunt at 16 months of age. She was regularly followed up and underwent extracardiac Fontan at the age of 5½ years. Pre-Fontan cardiac catheterization had revealed normal left ventricular (LV) filling pressure, mean pulmonary artery pressure, and pulmonary vascular resistance index. She had a smooth postoperative course and was discharged after 9 days of surgery. Her oxygen saturation at the time of discharge was 95% in room air. A gradual return of cyanosis, exertional dyspnea, and easy fatigability was noted by the parents for the past 6 months. Her saturation was 85% at rest and 78% after (10 min) walking. Cross-sectional echocardiography revealed normally functioning Fontan circuit. The ventricular function was normal, and there was no atrio-ventricular valve incompetence and no pericardial or pleural effusions. One small venous channel was seen arising from the brachiocephalic vein. Patient underwent cardiac catheterization; intracardiac pressures and Fontan pressures were normal. There was no fenestration. Innominate vein angiogram revealed a small venous channel descending on the left side. On selective injection, the venous channel was found to be communicating with the left atrium (LA). This channel was occluded using 0.038-inch, 5 mm × 5 cm Cook coil. Inferior vena cava (IVC) angiogram revealed a large tortuous venous channel arising at T8-T9 level and draining into the LA [Figure 1]a and b. Selective venous channel injection was also done which showed maximum diameter of venous channel 12 mm and the opening into LA measured 9.5 mm. An additional small vein was seen connecting the larger venous channel to the LA separately. Larger venous channel was test occluded using a 15 mm × 4 mm Tyshak balloon [Figure 2]. During occlusion, no hemodynamic instability was noted. There was no significant rise in systemic venous/Fontan pressure. The Fontan pressures before and after balloon occlusion were 12 mmHg and 13 mmHg, respectively. Systemic arterial saturation improved to 94% on balloon occlusion. 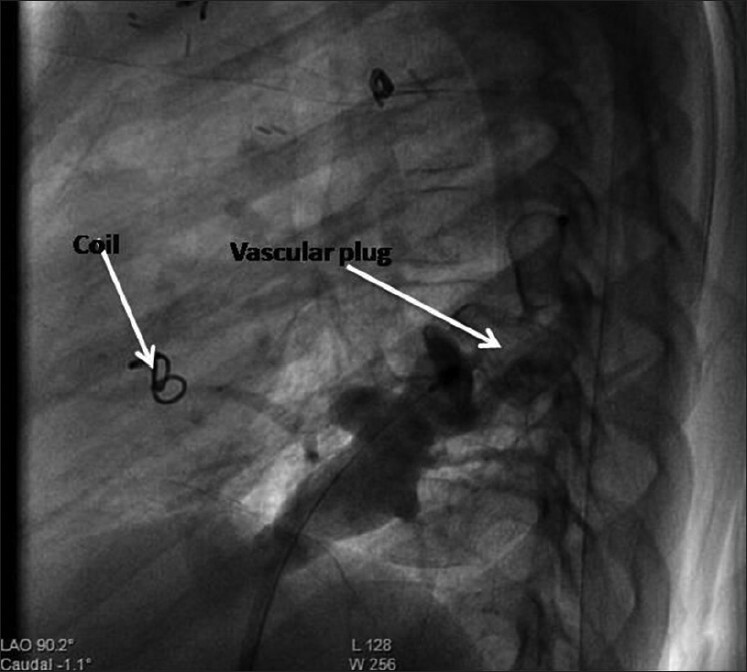 The smaller venous channel was first occluded using a 0.35-inch 5 mm × 5 cm Cook coil, whereas an 18-mm Amplatzer vascular plug was deployed in the larger channel [Figure 3]. Post-deployment IVC angiogram revealed complete occlusion of both the venous channels. Patient was discharged after 48 h of observation and has remained well at 6 months follow-up without any evidence of desaturation. All patients undergoing Fontan at our center have cardiac catheterization performed Preoperatively. During cardiac catheterization, both the venacavae are selectively injected and anomalous venous channels, if any, are occluded or ligated intraoperatively. Various authors have described occurrence of anomalous venous connections causing steal of systemic venous blood flow directly into the atrium or pulmonary vein, leading to progressive desaturation after Fontan completion. According to Sugiyama et al., brachiocephalic vein was the commonest site of origin of these vessels, followed by the left phrenic vein. A longer time from surgery at 3.3 ± 3.4 years was associated with identification of collaterals larger than 4 mm. Mean pulmonary arterial pressure was also higher in patients with the larger collaterals. These channels are often amenable to catheter interventions. Cook coils, duct occluders, and plugs have been used to close these channels. Though immediate results are satisfactory, a long-term follow-up is necessary to look for recanalization or opening up of newer channels. In our patient, preoperative cardiac catheterization had not revealed any anomalous venous connection; also, she had maintained good oxygen saturation in the postoperative period. 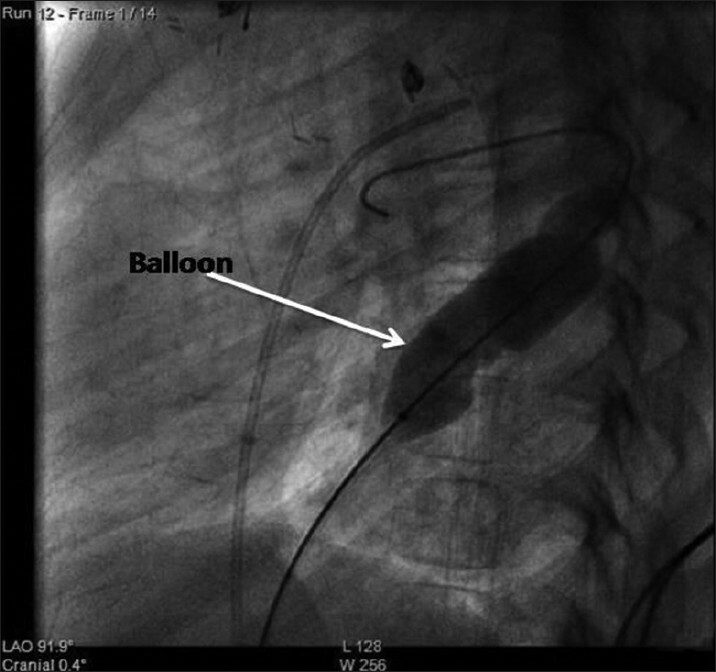 It is likely that this anomalous venous channel may have been inconspicuous at the time of Fontan completion, and enlarged gradually over a period and started causing significant desaturation. 1. Masura J, Bordacova L, Titte P, Brenden P, Podnar T. Percutaneous management of cyanosis in Fontan patients using Amplatzer occluders. Catheter Cardiovascular Interv 2008;71:843-9. 2. Sugiyama H, Yoo SJ, Williams W, Benson LN. Characterization and treatment of systemic venous to pulmonary venous collaterals seen after the Fontan operation. Cardiol Young 2003;3:424-30. 3. Hayabuchi Y, Inoue M, Kagami S. Rare venous connection causing severe hypoxia after Fontan operation. Interact Cardio Vasc Thorac Surg 2008;7:718-9. 4. Rothman A, Acherman RJ, Luna CF, Restrepo H. Enlarged left vitelline vein remnant as cause of cyanosis after Fontan procedure: Resolution after vascular plug. Pediatr Cardiol 2006;27:381-4. 5. Recto MR, Elbl F, Austin E. Transcatheter closure of large persistan left superior venacava causing cyanosis in two patients post-Fontan operation utilizing Gianturco Grifka vascular occlusion device. Catheter Cardiovasc Interv 2001;53:398-401. 6. Szkutnik M, Bialkowski J, Knapik P. Major intrahepatic veno-venous fistula after modified operation treated by transcatheter implantation of Amplatzer septal occluder. Cardiol Young 2001;11:357-60.